Following in the footsteps of seminal studies like E. W. Soja Postmetropolis: Critical Studies of Cities and Regions (2000) or Miwon Kwon One Place After Another: Site-specific Art and Locational Identity (2004), this article constitutes a contribution to our current understanding of contemporary societies, more specifically to the shaping of urban identities and the role of contemporary art when revealing the most current and ubiquitous mechanisms of cultural hegemony at the terrain of the visual arts. The interpretation is rooted in the analysis of concepts such as the site-specificity component of the works he discusses through the paper. To sum up, the article supposes a revision of historical and social aspects of public art, in which the language of hermeneutics intends to challenge rather than validate Modernity’s set of discourses of what public art is mean to serve. If you look for the entry Moebius strip in the Encyclopaedia Britannica, you will find the following very instructive example: “a drive belt can become worn out by friction with the wheels. If such a belt receives a 180º twist before its extremes touch each other, it can last longer, for then it will equally wear out on both sides. Such a belt is a model of a Moebius band. If such a band is cut in its middle part it has a second edge, which will also provide a two-sided surface (with its two twists)”. If we “round off” the aforementioned wheel until we turn it into a sphere (as it usually happens with tires in racing cars), then we could “translate” the first sentence as a warning against the danger undergone in the Sixties by the so called “hypermodernity”. Actually, in the postmodern urban architecture, a twist was made necessary, thanks to which technology and economy could interchange their roles at two points (or better, in two sections). Those inflection points come from two new conceptions of art, on the one hand, and space, on the other. This double twist has allowed, at least until now, the perpetuation and expansion of the global system and the partial return (though at times, as pastiche and parody) of energy to its sources (man and earth), feeding them back. After our image of the Moebius band, the section on which the twist is made constitutes public art. The turn was necessary due to the fact that it was and still is difficult to live, even if you are an American citizen, in the dehumanized cities of late modernity, in which a factory-like and penitentiary model is extended even to houses (as if architects had turned into public works engineers). As a consequence, the reaction against this state of affairs—which was hardly covered up in ideological terms by the needs generated at the end of the World War II—a soon came. In the cultural realm, that reaction received the inappropriate name of postmodernism. And though the concept and its reach were already relatively well defined in the sixtiesb, it seems appropriate to say that this “American way of life” literally exploded in 1972, when the local authorities of St. Louis, Missouri, were forced to order the blowing-up of a group of so-called functional houses (the Pritt-Igoe Complex), which did not function at all according to the necessities of the marginal groups to which they had been intended (thank God they were “marginal”!). This crucial moment will be taken as the starting point of the new architecture and, therefore, as the death date for modern architecture, according to Charles Jencks’s well-known and precise sentence: “Modern architecture died in St. Louis, Missouri, on July 15th, 1972 at 3: 32 pm”c. Public art is the child of the postmodern condition. And the first and natural reaction against “geometric” urban planning consisted in privileging time (the history of the city in particular, and of plastic arts in general) over space. If the motto in the so-called International Style had been “Demolition and begin anew!”, urban planners and architects will now proclaim all around (as if we were back to 1815): “Restoration!” The only problem was that, as it happened in post-Napoleonic Europe in the political realm, it was impossible and undesirable to really reestablish the Ancien Régime, because the conjunction of the brand new communication techno-science (also in its heyday at that time) and the neo-capitalist economy made the way back impossible. So that the solution adopted for the redevelopment (something like a “progressive restructuring”) of cities and public spaces was literally as superficial as the restoration of the Bourbon dynasty into the French throne. Both in 1815 and from our sixties onward a papier-maché show would be offered to calm down the people. A simple matter of performance. Pure façade. And in both cases large economic interests were pulling the strings. Pierre Vivant’s work (1992) (Figure 1) constitutes a dazzling instance of so-called “public art” at the service of urban restructuring. It is located in the entrance traffic circle of Cardiff Bay’s Ocean Park (a conflictive area par excellence, after the dismantling of a coal mine and its auxiliary industries). Pierre Vivant, Untitled , 1992. Reproduced from the publication: Public:Art:Space (1998). Photo © John Davies. Courtesy by Paca . Ocean Park is of course an ultramodern residential area, adjacent to an industrial area. Vivant’s work, known at local level as The Magic Roundaboutd, is a large scale presentation of the five classical geometric figures: sphere, pyramid, cone, cylinder and cube. Its surface is entirely covered by reflecting traffic signs: prescriptive, indicative, of speed limit, road signs and informative signs. 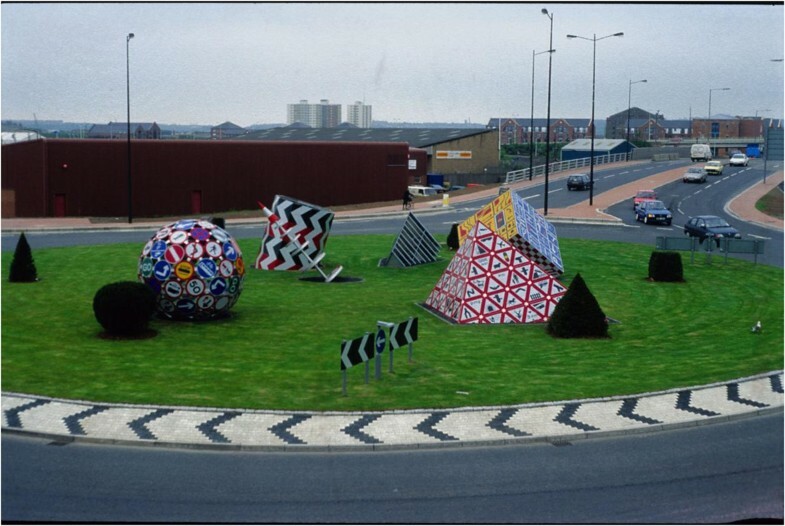 The work is an obvious direct homage to road traffic, and an indirect one to the systematicity and order of the new urban planning, and it can only be looked at when turning around it by car. We can see a hint of art in the transformation of signs into “things”, retired from the traffic they should guide. This “material” character of unavailability is stressed by the oblique position of the cube, which denies its stability, and by its being partially buried in the traffic circle’s paving. This oscillation can be perceived as well in the way the cone is strongly bent (in fact, it is a pole that strings six circular signs, like a skewer) and in the cone’s asymmetry, also bent, and whose base remains hidden, buried as well. Yet, the whole set has an affected air, hardly mitigated by the paltry presence of the organic: a few box bushes placed beside the figures, “artistically” trimmed—as in French gardens—to look like the adjacent volumes. This mannered coldness denotes the work’s serviceability and its evident message: the set is redundant, because it reinforces the traffic circle’s meaning, and also that of the emergent new class at whose service the artist is. Urban regeneration needs “ornaments” to highlight the new face of the city, hiding every trace of its sad and dirty past. So that, in this case, we should talk about a cynical public art, in the same way as this exclusive global operation is cynical, a real clearing of old spaces, of which Cardiff feels ashamed now (like Barcelona with regard to the quarters near the Ramblas). Indeed, seeing things in a rather cynical way, the solution found by redevelopment was perfecte. Beneath the—undeniable—need to transform the industrial periphery in residential areas (installing “clean”, non contaminant industries beside those areas, if possible), and especially beneath the need to transform the historic quarters of cities (though in America it was rather a Downtown bristling with skyscrapers) the “dregs” of marginalized people who had occupied those quarters were expelled (and still are expelled) from them—with peremptory eviction ordersf. Buildings with a “historical value” started to be rehabilitated then, and surrounded by renovated public spaces, in order to be strolled around and inhabited by, respectively, “hypermodern” (efficient and official) executives and their “web surfer” children who had left the city in fear, in search of an artificialized countryside. In this way the bourgeoisie seemed to be back to its old position, thus closing the cycle! The houses inhabited by the “deserters’” grandparents now shelter their “prodigal grandchildren”, tired of living in the bucolic suburbs. But all this was pure appearance. In the few houses still standing after “functionalist” outrages only the façades were left, that is, the public outside, but that was all. Inside, logically, houses have been built according to “high technologies”, as suits their inhabitants: on the outside, “postmodern”, playful and environmentally-committed (with urban environment as well) ready to feel the city as a lifelong thing and to dive into nostalgia and retro fashion imported from the US (the fifties!) and, inside, “hypermodern”, telematically linked like cyborgs to commercial and corporative nets, knowing themselves to be ubiquitously connected to any corner of the world, as computerized as themselves, and following the same rules dictated by the Market’s fluctuations, as Paris’ emblem says: Fluctuat, nec mergitur. What happened then with the parallelepipeds and “shoe boxes” that had substituted old historical buildings for their functionality? In rich cities, at least, like Barcelona and Munich before, and Berlin now, they are being unmercifully demolished and other buildings are raised in their place as if they were old (a bit more stylized and sober, to tell the truth) so that executives can live in them as if they were lifelong neighbors of that quarter. Everything is fake in this architectonic postmodernism. And its reproduction—as much technologic as it is fantastic—of nineteenth century and modernist architectureg is the breeding ground for one of public art’s expressions: the one closest to kitsch. 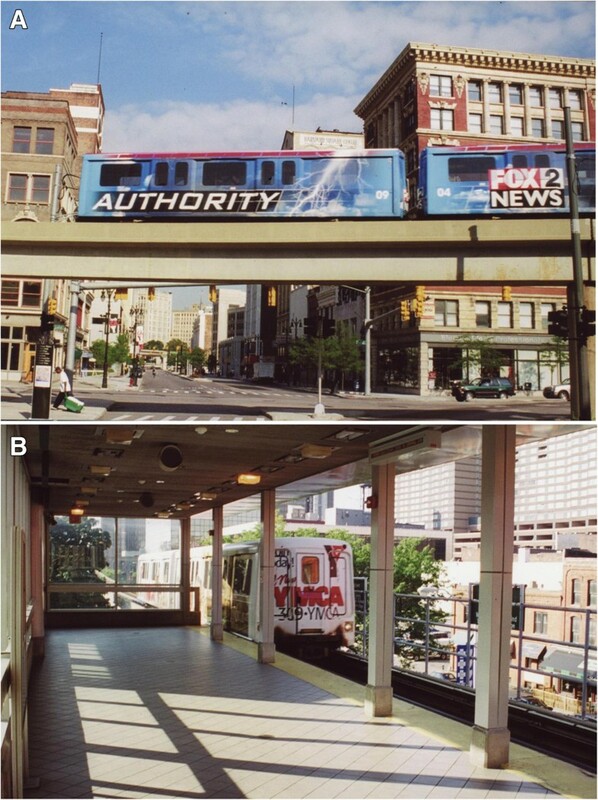 Instead of defining kitsch, it might be rather instructive to take a ride on Detroit’s brand new elevated transit system (a monorail called People Mover (Figure 2)) or at least to have a look at the local leaflet Art in the Stations, reproducing the “works of art” installed thereh. The circuit is 2.9 miles long and it has thirteen stations that surround and connect the different areas of the central financial district. Each station is adorned with large murals and sculptures to provide a supposedly “futurist” air to it. In fact, the term reflect and its derivates and synonyms are repeated up to eight times in the brief footnote descriptions of the thirteen illustrationsi! A & B. People mover. Detroit. Photos © By Mark Dancey. Courtesy of the Photographer. In the other cases we can see: 1) seven old cars (“a tribute to Detroit’s car industry”), reproduced as a mosaic in Cobo Center station; 2) a geometric mural, “in perfect harmony with the surrounding architecture” (Millender Center); 3) the only painting in the People Mover: three African-American people, dancing (“The Blue Nile” for the Broadway station); the footnote states that they are “eclectic articulations”. We are told about that, of the two remaining reproductions, one of them (“Neon for the Greektown Station”, by Stephen Antonakos) is “an innovative artistic form” and that the other (“Untitled”, by Jun Kaneko, for the Broadway station) has a structure which transforms into “an exotic environment”. Summing up: nine instances of mimetic art (seven murals which “freely” reflect the forms and artistic styles of the past, another one which reproduces pictures of cars, and a hyperrealist polychrome sculpture); an instance of geometric art, which “matches”, nevertheless, the surrounding architecture (of which the Omni Hotel stands out); and a mixed technique figurative painting (enamel and other products). Against them, an installation with neon lights (which, no matter how “innovative” it is, obviously reproduces neon signs in advertisements and nightclubs and bars) and only one abstract mosaic: a touch of “exoticism”. All the murals are mosaics, except the bronze sculpture and “The Blue Nile” painting. Why? Obviously, to facilitate the cleaning of possible graffiti. There is no need to care about the painting, for it celebrates the “joy of living” of black people, one of the most problematic groups. And the bronze sculpture, apart from being an enduring material (used before to portrait gods and heroes), reproduces—so will the underground user think—“one of us”, so tired and depressed it would be a pity to dirty its vera effigy. All of them are perfect instances of kitsch public art. All of them are eclectic, they accept all styles and sensibly mix them to attain a panstylism both shiny and dull. All of them are consumer goods, easy to understand and to digest (User-friendly art!). Fake. In these “beautiful”, placid works everything leads to serviceability, with no trace of earth, no hint of unavailabilityj. With the financial support of any donors, whose names are carefully listed beside each representation, the local authorities want to transmit a political message to users, that is: that it is not true that Detroit is losing its population and that its skyscrapers are abandoned to the elements, that it is not true that heavy industries are being dismantled or that it is a suicidal act to take a walk by night. On the contrary, we have to be optimistic, dynamic, and especially to have the feeling that Detroit collects through its artists’ the best of the past (artistic and industrial) to put it at public service. Pure concealment: behind the shiny surfaces lies the capitalist’s interest for his workers’ good state of mind, the Mayor’s interest in being reelected, users’ own interest for acquiring some artistic knowledge to provide them with a touch of class. There is no sign at all of man’s effort to inhabit the earth. Moreover, so bright and new a People Mover can be also used by car companies’ high managers, thus mixing “democratically” with their employees from one building to another, and then going back to their renovated houses, also impregnated with the flavor of the past. Style houses, after all. What were the authorities looking for, advised by the local art committee, when they ordered those works? In my opinion, they were trying to defend themselves from something which might had been in the people’s hands, rather than offering something to them. Farmington Hill’s City attorney frank words are worthy of quote in connection to this: “We do not want to leave a work of art to imagination”k. Of course not! It is necessary that the public understands the work, without having to imagine anything. And especially that, with their average intelligence, they understand what their place is and who governs the city. As Harold Rosenberg said a long time ago: “When art becomes a prolongation of everyday life it gets ruined, turning into a commodity among others: kitsch”l. That is what the public art of the People Mover is: kitsch. From the monorail, users can also admire an icon about to “knock down” (literally) the traditional one, the Spirit of Detroit. In a sudden contrast with the shiny playfulness and “futurist” optimism of the People Mover, downtown, a monument can be found on the Federal Building’s left, consisting on four long oblique poles standing on a pyramid-shaped granite plinth. 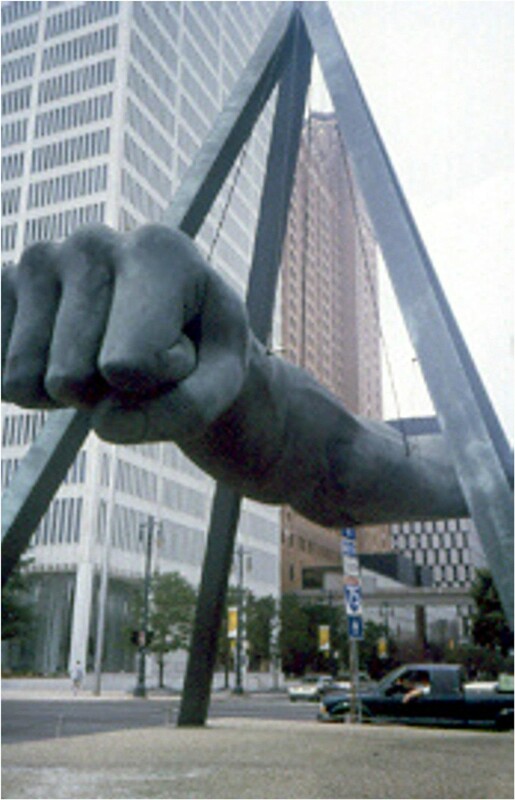 A gigantic bronze arm with a threatening closed fist hangs horizontally on its apex, exactly in its middle point (that is the name of the “sculpture”, The Fistm, as a homage to the local hero’s knock-out: Joe Louis (Figure 3)). The Fist , as seen from Woodward Avenue. Photo © Ruth Perez-Chaves. Courtesy of the Photographer. This monument to “wise”, controlled strength fulfills several functions, none of which is artistic at all. In the same way as the aforementioned murals, it also tries to connect with heroic sculpture au grand style, from Michelangelo to Rodin, though it reminds us less to the Notte in Julius II’s tomb or to the penseur than to the titanic arms of the apostles in the Valle de los Caídos (of sad memory, not only in artistic terms) in Madrid’s mountains. Every anatomic detail of the arm in tension is perfectly reproduced, so that Robert Graham’s work does not lend itself to the watcher’s imagination: everything is real, only larger-than-life. The heroic tradition, then, at the glory of Detroit’s service. Moreover, the arm is naturally black, in violent contrast with the plinth and with the official building in its background, to its right. As in The Blue Nile, here there is also an attempted homage to the black community, pointing out, by the way, where the road to success is for them: not in intelligence or in industry, but in sports. Apart from that, the Fist does not point to the official building (it is rather before it and parallel to it), but to Woodward Avenue. The cars driving along the avenue go too fast to feel threatened by it at all; nor does the walking visitor feel threatened, as the arm is located far above human heightn. The statue was a present—a poisoned one, that is for sure—to the Detroit Institute of Art (DIA) from Sports Illustrated magazine. From the solemn day of its inauguration in 1986 onward, the magazine sponsors every year the “Joe Louis” prize to the city’s best sportsman, who is awarded a miniature version of “The Fist”. Therefore, the public is here presented as: 1) a “democratic” culmination of a classic tradition which sees relevant historical events as deeds that carry eternal values, accomplished by great men, “chosen by destiny”o (god, hero, Caesar, condottiero, nineteenth century soldier, fascist leader and boxer); 2) a symbol of social cohesion: the work is at the public’s service, so that they learn to imitate the genius loci; 3) a paradigm of figurative, mimetic art; the public “understands” what they are seeing: it is a left arm as every man’s, only bigger, solid and black; 4) a good pretext for publicizing a sports magazine, which, the moment it donates it to the DIA is ipso facto coated in “academic” dignity (substituting the old alliance between arms and letters for the one between the ring and plastic arts). Finally, its size and its location do not disturb the traffic or the passersby, but neither do they “open space” or irradiate places, pointing to possible ways of life: this gigantic sculpture could be here or anywhere else in the city. And those who contemplate it are exempted from thinking or reminding the—racial, political, mafia-related, etc.—circumstances surrounding Joe Louis’ career. The monument does it for them, preventing them from being conscious of their place in the world as members of a community, belonging to a particular race and social condition, etc. The iconic appearance of the monument conceals the meaning of its referent. The ideal projection of the past into the future, urging aemulatio, prevents us from thinking about history. That is kitsch. If we had visited before November, 21st 1991 the city of Ford and Cadillac, of Joe Louis and Dillinger, but also—right now—the city of the Michigan Building Theatre converted to a parking lot, the city which is to be seen as an international entertainment hub with casinos, new stadiums, and a riverfront revitalization project; and if we had directed our steps to the East Side, to the crossing of Mt. Elliot Avenue with Heidelberg Street, we would have found a weird spectacle: within a marginalized quarter, full of filthy abandoned houses (night shelter for alcoholics and small drug dealers), five of those houses were stuffed with heteroclite objects, some of which were painted in loud colors. This was the heart of the so-called “Heidelberg Project”p (Figure 4), a work by the Afro American artist Tyree Guyton, first helped by his wife and his artistic “master”, the old Grandpa, and then helped by the neighbors. One of these houses was full, inside and outside, of ripped off, beheaded or mutilated dolls (Babydoll House). Another one (Fun House) chaotically accumulated all kinds of waste, from its roof to the dilapidated entrance steps. Another one (Tire House) was invaded by tires of all kinds and sizes. The forth one referred to the little world of the marginalized black community (Your World), and the fifth collected, at last, lost objects (Lost & Found), turning them into museum pieces in which it was difficult to distinguish between the container and the thing contained. Not happy yet with this pile of waste and its ironic—and at the same time melancholy—conversion into works of art after being painted in loud colors by Guyton, he taught the kids of the neighborhood how to use brushes, while the neighbors themselves brought all kinds of useless objects from their homes. 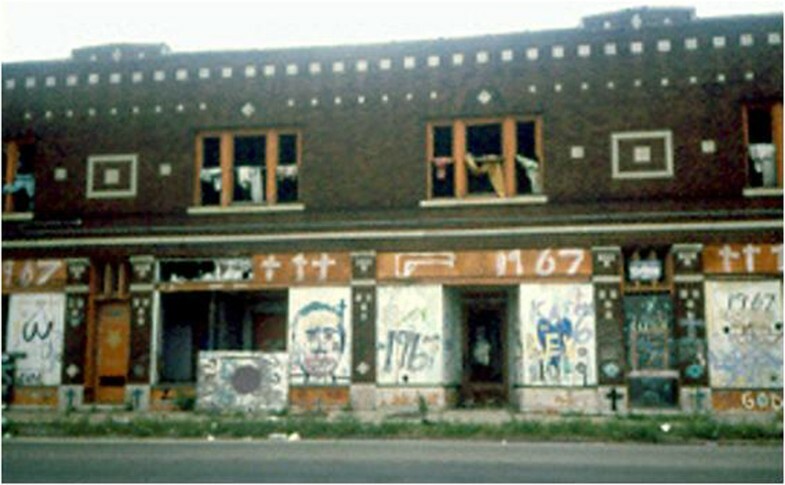 The artist began the transformation of his neighborhood in 1986, precisely when the Joe Louis monument was inaugurated. And in 1989 it received the Spirit of Detroit award for its contribution to the arts. Heidelberg Project – Shene Street. Houses with Polka Dots. Photo © Ruth Perez-Chaves. Courtesy of the Photographer. Visitors to the city, even foreigners, started to visit the neighborhood; and as a result of all this small time crooks and hobos disappeared from the area. But not everything was for good. Some of the neighbors, who tried to keep their houses “decent” in the middle of the usual social chaos, could not stand the added “artistic” chaos (it is not the same thing living near empty and half-demolished houses than living near houses full of junk piles and waste), and they began to submit their complaints to the City Hall. So at the aforementioned day’s dawn (taking advantage of the fact that that year’s Thanksgiving Day was a weekend day), the bulldozers supported by the police and even by a helicopter started to dismantle the Heidelberg Project. The most meaningful thing of it all is that the City Hall has not demolished either before or after that any other house or equipment that had not been touched by the artist. However, Guyton has not given up his efforts, till today. He hanged rickety bicycles from trees, he covered Heidelberg Street with worn out shoes (what would have Heidegger said of those blacks’ shoes?) and painted with bright colors an abandoned bus which, to tell the truth, was the City Hall’s property, so that he has been prosecuted. What could be said about the Heidelberg Project and its sequels? In the first place, that it was never a health problem: Guyton did not collect organic detritus for his work; he just piled up and distributed in a fragmentary way domestic or industrial waste, broken or useless objects, presented as such or painted and transformed. The same thing was being done at the same time or a little earlier by such renowned artists as Robert Smithson (his Spiral Jetty is made of junk), Janis Kounellis, Julian Schnabel (see his San Sebastian), or the one who is probably the most representative artist of this “residual” tendency: the great Tony Craggq. Arte povera comes behind them and their undisputed masters are Duchamp and Beuys. In the second place, and in opposition to his celebrated contemporaries (Cragg is only three years older than Guyton), this Voodoo Man—who had an academic training—does not work for museums or collectors (either directly or by means of exhibitions of documents and photos, as in land art works). He does not really work for anyone (though he uses his fame of course to get little installations into museums). Maybe for his neighborhood. Nor does he make works for the street, as in nineteenth century monuments, but he makes them in the street and with the street: in abandoned houses and with the neighbors’ contributions and the collaboration of children and other spontaneous “artists”. In the third place, some meaning can be deduced from the accumulation of objects: a meaning based on the opposition –in musical terms- between colligamento and contrasto. As it has been said, the Babydoll House collects dolls, and the Tire House, tires. The old shoes were carefully and regularly displayed in lines. But the contrasts acquire greater relevance: from the surrealist gesture of putting an old boat on a house’s roofr to that of hanging bicycles from the trees as fruitss; and even more interesting is the union of both factors: connection and separation. The byproducts are painted with bright enamel, like real Greek daídala, thus showing in a strident way the difference between surface and matter, an obvious allusion to the opposition between the Council’s superficial ideology and the true reality of neighborhoods. But this opposition surely has a graver and more disturbing meaning: it lets us see the artist’s pieta towards the uselessness of artificial products, as they are “impregnated” with the joys and sorrows of their old users (a direct accusation of the modern circuit “production-consumption”). As for the formal connections and contrasts (always with a political background), its symbolism is evident: the tires which fill the house are not in their place (they should be rolling in cars), nor do they have the appropriate form. One needs not be McLuhan to remember the secular obsession with “squaring the circle”: the wheels are circular crowns while the house is a cube, with rectangular windows and straight lines. The objects which “line” the walls, placed on the roof or piled up in the outside perimeter of the house should be inside, etc. All these incongruities seem to point of course to that fundamental feature of art we have called “earth”, as unavailability, opacity and retraction. In the fourth and last place, this art would deserve—more than the works in the People Mover or the Joe Louis Monument—to be called public art par excellence. In it, not only does the public collaborate with the artist indeed (including his relatives), but the true topic of the work is the public, the inhabitants of this miserable “Roma quadrata” bordered by Preston St. (North), Mt. Elliot Ave. (East), Benson St. (South) and Elmwood St. (West), with its two axis: the cardo (Ellery St.) and the decumanum (Heidelberg St.). The contrasts between objects and houses are a sensu contrario lessons on the functions public space should fulfill: the broken dolls are the children with no future of this prolific urban proletariat; the wheels with no tires or bodywork, the hanged bicycles or the empty, ownerless shoes (the three possible means of locomotion: automobile, mechanic or “living”)tsay there is no place to go and that if there is a solution, this must come “from the inside”; the Lost & Found House warns of the need of solidarity and mutual help, together with administrative organization (by the way, the Heidelberg Project was self-managed for a short time like a real corporation; a scarcely profitable one, to tell the truth). And, last but not least, the houses stuffed with waste denounce by means of contrast the waste in bourgeois homes; they throw away the junk collected by the homeless. To sum up: they cry out before the Council’s very face what it tries to conceal at any price. Simply and literally: that no one should live in that “square” of misery. It is not strange that the Mayor at that time, Coleman Young, hurried to dismantle the Heidelberg Project, leaving intact—so to say—the evicted houses. No one protests in empty places; and if hobos and dealers contribute to make the area still more uninhabitable, it will constitute a good additional excuse for a real estate company to decide its redevelopment someday (in the same way as the Renaissance Center wants to do for the Downtown, serving as a point of attraction for tourists and casino gamblers). And yet, even if Guyton & Co.’s work deservingly features a sensu contrario the “construction” of “political space”, that is, as the extremely hard social denunciation on the part of our Voodoo Man, I cannot help having some qualms about the strict artistic character of Heidelberg Projectu. The link through mutual meddling of “man” and “earth” is indeed missing here. Both elements are juxtaposed in the work, as well as in the neighborhood houses; only in some cases the earth has been worked upon, and only superficially anyway (by covering waste with paint), rather concealing in this way its materiality, instead of bringing it out to light, “from inside to outside”; the byproduct is still a byproduct; the materials, still materials: certainly, they keep the trace and the human warmth of their collective use, but the artist has not elaborated that trace. That explains the easy—and unfair—accusation of littering for this “Rembrandt of waste” and “Giotto of junk”v. Certainly, few artists have linked like him—though in a somehow filthy way, to be true—the two convergence lines of public art: the grandeur of classic root (a whole neighborhood in his hands, to model ad libitum houses and backyards, streets and trees!) and the merveilleux of romantic origin. As for the first, it is enough to “clean” a little bit the material filth to realize the quasi Roman “geometrization” Guyton performs on his work and his neighborhood’s quadratum. He thus opposes, as it has been said, round to cubic structures, curves to straight lines, the vertical to the horizontal, the mobile to the static, the natural to the artificial, etc. ; and he opposes, to sum up, the peripheral suburb to the city center (though things are not going well for this one either). The academics who took part in the controversy went off at a tangent looking for I don’t know what ancestral and racial antecedents to defend Guytonw, while he told to anyone who would listen that he and his art were “universal”, and packed up to leave for Germany. In all reason… classic, formal. As for the “romantic” side, we just need to see that he, the individual Tyree Guyton, is the Heidelberg Project, that he is the whole neighborhood’s soul, the hero of crowds, as a tenor standing on the proscenium to sing an aria di bravura while the chorus joins him only in the finale (the complaining neighbors represent instead the choir of villains in this opera, a bit buffa). We just need to realize as well that the piled up materials, common use(less) junk when we look at them in isolation, are juxtaposed so that they provoke stridencies, inadmissible contrasts presided by “order versus chaos”. Guyton alters all the usual relations among objects, thus provoking the public’s astonishment before the prodigious (remember he is called the Voodoo Man), before a heteroclite vortex that reminds us—in a dirty version—of the Land of Oz (“Toto, I’ve a feeling we’re not in Kansas anymore!”) that beings to shine in the middle of waste, like Tony Cragg’s New Tones, Newton’s Tones. But this malicious comparison returns us back to reality. Guyton has so much “earth” accumulation (there is nothing as unavailable as waste) that it runs the risk of becoming what it was again, a pile of junk, but he lacks technique instead. He lacks the trace of human work: there is no method; there is no order or arrangement in his procedure, and not only in the scarcely worked material texture, but in the spatial arrangement of the objects among them and in relation to their containers (the house, the backyard or the street). The dolls in the Babydoll House could have been placed in Your World as well; the wheels could have been hanged from the trees instead of the bicycles. Why not? I do not think Guyton would have an answer for this reproach. The closest approach to this ideal of denunciation, and hence the most beautiful, moving and subtly unmasking work of public art I know of is accomplished, literally facing the public, at the Vietnam Veterans Memorialx (Figure 5): a cenotaph at the end of the Washington Mall—where we return now in pain—a broad “wound” on and of the earth, open like a V, like a grand obtuse angle (125° 12’) that points, on one side, symbolically and intentionally, to the obelisk raised to honor Washington and, on its other side, to the Lincoln Memorial: to the Nation’s father and to the tortured witness of the Civil War. 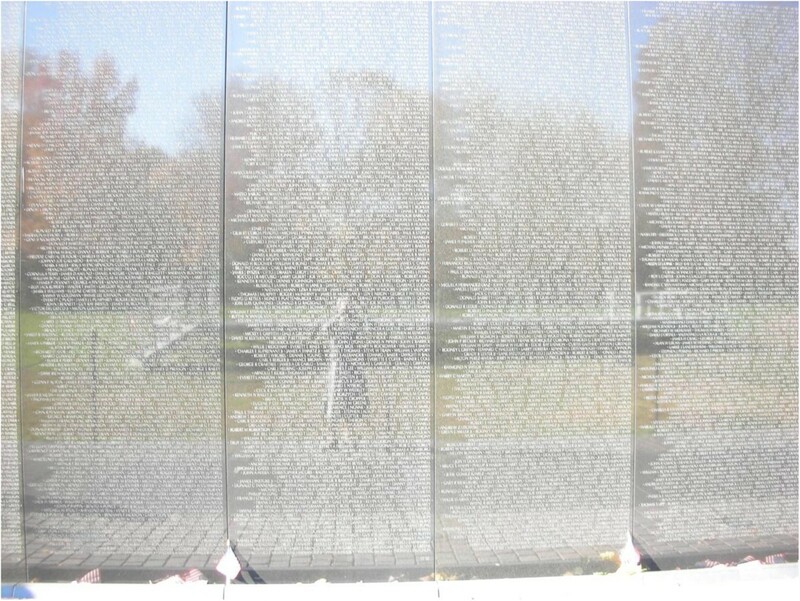 Maya Ying Lin, Vietnam Veterans Memorial, 1982, Washington, D.C. Photo © Clara Echeverría. Courtesy of the Photographer. To access this huge scar—which keeps an incurable wound—you have to descend to the earth, for the Memorial is excavated into a hollow, like a trench… or a long common gravey. The Memorial, indeed, cannot be seen from a distance: it is necessary to go down, to commit with and meddle in those two long walls of polished, reflecting black granite, so that the public sees itself reflected in this Laments Wall, as if it were a mirror that returns its truth… but not its dear ones, dead or disappeared in Vietnamese swamps. Arlington Cemetery is not far from the Memorial. Selected and distinguished “heroes” of the Nation rest in it. Close to it as well is the Iwojima Monument, so figurative and “moving”, with its bronze soldiers raising the American flag on an earth turned into scraps, hollowed by the brave combatants of civilization. It is topped by a plinth (like any monument that deserves the name; for instance, the one devoted to Joe Louis in Chicago) with a laurel crown. Unfortunately The Wall, as popularly named, had risen similar controversy to that of Serra´s Titled Arch in New York. However, in this case because of the context of the piece, the result of these polemics constitutes a more dramatic and sad outcome. It seemed that in the opinion of many, the viewers, in order to imagine and feel the pain, needed to be in front of human figures (however in bronze). Consequently, an addition was placed next to the concise Vietnam Veterans Memorial, a sculptural group that represents very realistically three soldiers, called The Three Servicemen Statue. Furthermore, this was not the only change that was made to the original setting. Some complains later originated due to the lack of female figures at the composition of The Three Servicemen Statue, and this absence was “politically corrected” by the addendum of another section, the realistic sculptural group made in bronze as well, The Vietnam Women’s Memorial, dedicated to the women who served at the war. This latter appendage includes a gravestone. The Vietnam Veterans Memorial does not present (did not present!) any figure. Only names. The names of the 58,000 people who died or disappeared in the war, in chronological order according to their casualty date, with no distinction of military ranks or corps. Moreover, the arrangement of the names in this (physically open, but symbolically closed) book seems strange at first sight. The list begins with the indication of the war’s beginning year (1959), and the first name is engraved in the right superior extreme of the angle’s vertex (in the “book’s” right “page”); the list continues from top to bottom and from left to right, to the western tip of the “page” (precisely the one pointing to the Lincoln Memorial). This is not casual. As in Chartres’ Cathedral, as in the Lincoln Memorial, the West symbolically means death and desolation: it is the place where the sun sets. But if you want to go on reading, you must undo your way to the tip of the “page” which points to the East (which obviously indicates resurrection, the rebirth of life) and approach the center again, until you get to the last date (1975) and the last name (in the right inferior extreme of the left “page” of this book made to be read backwards), thus ideally closing the list at the center of the Memorial, so that no name can be added to it later (that is to say, neither in this war, nor in any other one). The two dates, 1959 and 1975, are respectively followed by two brief inscriptions: the summary and the moral of this two page “book”. The first one reads: “In honor of the men and women of the Armed Forces of the United States who served in the Vietnam War. The names of those who gave their lives and of those who remain missing are inscribed in the order they were taken from us”. Seeing this inscription, one instantly remembers the first words of Greek thought: “Whence things have their origin, thence also their destruction happens, as is the order of things (katà tò chreón); for they execute the sentence upon one another—the condemnation for the crime—in conformity with the ordinance of Time (katà tèn toû chrónou táxin)”z. War and thought, thus united in this infernal circle, which art bravely (though in vain) tries to conjure with the arrangement of the names. The second inscription aspires to lend a patriotic “air” to the Memorial (a sober one, it must be acknowledged). Now it is the Nation who speaks (in the third person and in indirect speech), not the “us” of the initial words: the set of all of those who lost their dear ones and, in general, of a whole people shocked by a war they ended. A stupid war, without winners or losers. Only death and destruction. Nevertheless, the final “message” is fortunately mitigated by the inscription’s last words. Simple and proud words, which remind us that this extraordinary funerary monument belongs to the People, and not to Power. Compare the conventional beginning with the second sentence: “Our Nation honors the courage, sacrifice, and devotion to duty and country of its Vietnam veterans. This memorial was built with private contributions from the American people. November 11, 1982”. Meaningfully enough, what is usually said in conventional monuments, “erected by public subscription”, is not said here, but “built with private contributions”. At last, the so long desired identification between private life, assumed responsibly, and public monument, has been accomplished. Moreover, the Memorial came from a public anonymous competition. A project was chosen among more than one thousand four hundred. It was designed by a twenty-one year old girl, an architecture student of Asiatic origin called Maya Ying Lin. In this way, creation and reception, East and West were joined into a single mournful hug. It does not matter that the Memorial is studded with flags and flowers, as if the visitors to this empty “cemetery” would want to conjure the austere dignity of the written stone, giving color and variety to the monument. In vain. What is usually done in columbarium niches, where there is enough space for each deceased person to go on enjoying a fictional private property—of each one’s flowers, portrait or votive lamp, devoted exclusively to each of them—cannot be done here. The succinct mention of the lined names precludes any identification but that of the deceased (or disappeared) and the dateaa. Here, at the Vietnam Veterans Memorial, after descending the smooth grass hill, we leave at our backs the bombastic signs of the Nation-State, which try to homogenize the people as public in order to use it for the great occasions. Here there is no theatre or representation, as in romantic opera. There is only quiet and self-controlled pain. Only a latent warning: Nevermore. The Mall is now empty. At the feet of Maya Lin’s work, instead, the dead’s relatives and friends see themselves spectrally reflected in the smooth black stone. Men and earth, united by art, linked by the common space of pain and living memory. A single whisper brings together the prayers and cries, and mixes with the soft murmur of autumn trees. It is the people’s wind, and the earth’s, which gives breadth and life to public art and political space. aIn Europe, and especially in the (at that time) two Germanies, the International Style was imposed by necessity, due to the great need of reconstructing the cities that had been bombed. In the United States (and in the mimetic “developing” Spain) it imposed itself due to the pure speculation over urban land, which was revalued after sweeping annoying old buildings from its surface. Again, a good instance of grubbing up, with controlled explosions and pickaxes instead of felling and burning! bSee my book Postmodernismo y apocalipsis. Entre la promiscuidad y la transgresión (“Postmodernism and Apocalypse. Between Promiscuity and Transgression”), Buenos Aires, Universidad Nacional de General San Martín, 1999.
dOn this work, see “A Strategy for Public Art in Cardiff Bay”, in Public : Art : Space. A Decade of Public Art Commissions Agency, 1987-1997, with an introductory essay by Mel Gooding. London: Merrel Holberton, 1998, p. 43.
eAnd still allows for many possibilities: note the “postmodern” transformation of Barcelona in 1992, having as an excuse the Olympic Games in the city. fThe set of “marginalized” people includes indiscriminately (“unproductive people”, that’s all!) old pensioners, little artisans, students, prostitutes and more or less illegal immigrants. For further information on this, foccusing on American society, see Rosalyn Deutsche’s enlighting book of the same title Evictions, Cambridge, Mass., and London, The MIT Press, 1998 (maybe a bit too “feminist” at times, but it might be my own gender that incites me to see it that way). gThat is why, at least in this case, it would be better to talk about “retromodernism” instead of “postmodernism”, as it is to an invented version of modernism (taken from the movies rather than from historical reality) that we are returning, after the demolition of International Style (usually only inside the cities; industrial buildings simply “flirt” with the newest style). hI would recommend to read the leaflet together with Michael Hall’s excellent essay “Forward in an Aftermath: Public Art goes Kitsch”, in A. Raven (ed. ), Art in the Public Interest, New York, Da Capo, 1993, pp. 325-343. Anyway, if you do not have access to those documents or my analysis seems not enough, it would also be instructive to visit—better by night—Malasaña or Antón Martín quarters in Madrid, to think about this “repristination” of the ruins of the modernist Palmyra, to look for the many and recent “old” cafes, with their “fake” turn-of-the-century decoration, with the patina of marble tables and (pseudo) oil lamps, with their marquise and their advertisements. The only missing thing would be two policemen on the corner talking about the “social issues”. If this goes on, we will soon enter an adulterated “1900” instead of jumping into 2000. The closer this fateful date is (I am writing this in September, 1999), the more we go back to the world of our grandparents… as seen by Hollywood (or, in the best of cases, by Marcel Carné, Max Ophuls or Billy Wilder). iWe are told in the leaflet that Tom Phardel’s work (in which Pewabic Pottery, the company that provided the materials and collaborated in the design, is advertised), in the first stop (Times Square), “recalls art deco style”. About Voyage (Allie McGhee; second stop: Michigan Ave.) we are told that it “reflects” the environment’s energy. About On the move (Kirk Newman; in the same station) we are told that it “reflects” people running to catch the train. About the other Voyage (Gerome Kamrowski; fifth stop: Joe Louis Arena) it is stated that the author has “freely… based” his mosaic on “mythological and astrological figures of the seventeenth century”. About D’ for Detroit (Joyce Kozloff; sixth stop: Financial District) that its “Byzantine and Aztec figures” receive the influence of other murals (among others, from Diego Rivera’s famous one in the DIA). About Dreamers and Voyagers Come to Detroit (George Woodman; eighth stop: Renaissance Center) that its glazed pottery tiles “reflect” the forms of the building which gives its name to the station. About In Honor of Mary Chase Station (Diana Kulise; eleventh stop: Cadillac Center) that there are tiles scattered throughout the mural “depicting Detroit workers”. And at last (thirteenth and last stop: Grand Circus Park) the leaflet reproduces a life-size bronze sculpture (a middle aged man, bald and with a moustache, wearing a wrinkled suit and a loose tie, reading a newspaper: “he looks so alive!”). In the footnote we are told that passengers will recognize “their own reflection” (of course!) in the statue of the commuter of the People Mover. The leaflet (with no specification of place or year) is edited by the Detroit Transportation Corporation. jIt seems unnecessary to note that my insistence on earthly “unavailability” does not mean at all that the work should be terrible, ugly or deformed to be considered as art. There is “earth” in the possibly most beautiful painting of the history of art: Rafael’s Madonna Sixtina, in Dresden; there is earth even in the divertimento represented by the two little angels hanging from the painting’s edge. The earth comes to light, buried in the light sfumatto of the distracted angel’s arms looking upwards, in the hard consistency of the supposed window’s parapet on which he leans sweetly, in the background’s vaporous ochre, which does not refer to anything (natural or supernatural). Nothing can be done with this painting, not even praying before it. Literally, it has no use. Except to space “world”: order, meaning and melancholy around it. kQuoted in Hall, p. 339.
mThe granite plinth is 6 feet high and its base is a 24 feet square: the same height as that from its center to the “pyramid’s” apex, the same length as the arm’s. So that, without the plinth, ideally extending its sides, the set would be a cube: perfect stability, quietness and solidity, denied by the fist’s gesture: frozen dynamism. nWhere is all the aggressive potential energy of the closed fist then discharged? Of course, into the void. I do not know whether this dysfunction, this lack of sense—which could easily be turned into a critique of the statue’s own monumentality—has been taken into account by the sculptor. It would redeem him partially from his serviceability to Power, as the empty fist questions all the aforementioned functionalities. oSee chapter I of my book El sitio de la historia (“The Place of History”), Madrid, Akal, 1995.
pI owe the extensive information I have on the “Heidelberg Project” (and to a good extent on art in Detroit in general) to the enthusiastic help of Ruth Pérez-Chaves, who collaborated with the aforementioned Detroit Institute of the Arts (DIA) in 1999.
qSee the brochure Cragg, Madrid, MNCA Reina Sofía, 1995, with contributions by F. Castro, F. Duque, B. Pinto de Almeida and M.A. Ramos, which contains as well an interview and some of the artist’s writings. sHere it is also easy to decipher the oppositions: the bicycle moves along a horizontal line, while the tree is vertically fixed. The first, to be a good means of transportation, needs an artificial road surface: pavement or asphalt (there are no mountain bikes at all in Heidelberg Street! ), on whose surface it moves, while the tree buries its roots in the soil, in the natural. tThere are no horses in Heidelberg St., obviously. Remember, moreover, that Detroit is the car’s symbol-city par excellence. uThat is why I have anticipated a caveat (“it seems”) or used condicional verb tenses (“would deserve”). vB. Darrach and M. Leonhauser, “Scene”, People (August, 15th 1988), p. 58 (quoted in M. Hall, p. 327, note 6). wOf course—newspapers and elitist art magazines said—we, occidentals, colonialists, imperialists and many other evil things, do not make the effort to understand… these poor wild men, as the intellectual carriers—and denouncers—of the malaise wanted to say. Those who lend their voice to the “voiceless” usually resemble those who insist on helping a blind man to cross the street: they show their compassion in this way, and hence, their superiority. They are, in an intellectual version, what the Ladies Association of the Pious Wardrobe—or however it is called—on the realm of “social assistance”. xFor further information and details on this monument, I would recommend reading Charles L. Griswold’s “The Vietnam Veterans Memorial and the Washington Mall: Philosophical Thoughts on Political Iconography”, in Senie and Webster (eds. ), 71-100. Regarding it, I must say I ignored the subtitle and some “philosophical thoughts” such as: “the predominant feeling experienced in the Memorial’s dedication was patriotic, and hence therapeutic… almost everyone seemed to feel that America is still like a ray of light in a somber world” (94). Griswold ends this sermon of patriotic exaltation, and the whole essay, with an unforgettable sentence, between innocence and cynicism: America remains fundamentally good. Amen. yWatching the Memorial I cannot avoid remembering, between nostalgia and painful sarcasm, the happy ending of Faust II, when our Doctor in Philosophy, turned into Public Works engineer, makes a clearing to drain a swamp for the public benefit: a long channel seen by the Lemurs as a grave, that is to say, as Faust’s own grave. He is redeemed in extremis, however, because Margaret’s particular love for him is returned by Faust’s general love for his people. Faust has also loved a lot. More, and more people, than Magdalene and Margaret. Moving end. zAnaximander, Diels-Kranz 12B1. Apparently this is the oldest authentic fragment we have by a philosopher, though it is probable that the ipsissima verba really begin in: “as is the order of things”. aaHegel once said, in § 462 of his Encyclopedia of Philosophic Sciences (1830): “Reproductive memory has and recognizes the thing (Sache) in the name; and with the name, the thing, without intuition or image” (Werke, Frankfurt/M, Suhrkamp, 1970; 10, 278). Many people at the Memorial who have probably never read Hegel apply a sheet of paper to the “photogravure” of the dead (or disappeared) relative’s or friend’s name and rub a pencil or other sharp object to the sheet’s reverse side to take the funerary inscription home, as the most precious reminder of the forever absent loved one, “without intuition or image”. An innocent and moving frottage im memoriam.